Mason Dragos competes on the Butler tennis courts. Dragos is 10-4 in singles matches this season. Jimmy Lafakis/Collegian file photo. Following their losses to Georgetown in last year’s Big East Tournament — in the first round for women and quarterfinals for men — the Butler tennis teams took time regroup in the offseason. While some key seniors have left the program upon graduation, new players will be stepping up to fill the important roles they held. With newly appointed head coaches Matt Moore and Daniel Pollock for the women’s and men’s teams respectively, the programs are seeing change that could help them down the stretch. Here’s what to keep an eye on throughout the 2019 tennis season. 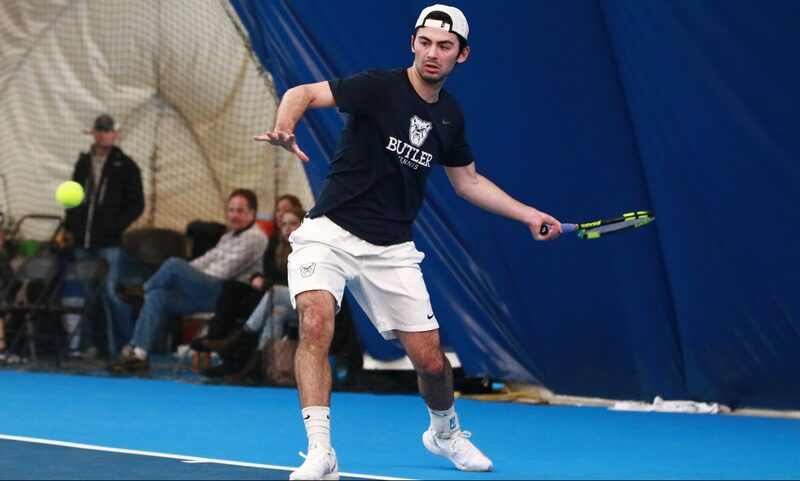 The Butler men’s tennis team finds itself in a position to experience success, but also to learn, as the Bulldogs continue their 2019 season. Currently sitting at 4-3, the team swept its matchups on Feb. 1 and 2 against Youngstown State, Cleveland State and Marian. The play of senior Mason Dragos and sophomore Michael Dickson has been impressive, and help prove they are among the best in the Big East. Dragos has been named to the All-Big East team every year since he was a freshman. Currently, Dragos sits at 10-4 in singles matches and 11-7 in doubles alongside senior partner Aviv Ben Shabat. Dickson was voted Big East Rookie of the Year and named to the All-Big East team in his first year at Butler. He is 8-7 in singles and 12-9 in all doubles matches. The squad is comprised of six seniors, three sophomores and five freshmen. The Bulldogs have veterans capable of winning important matches. They also have young talent who can compete and learn from the upperclassmen. Thomas Brennan could be one such freshman. In his homeland of Ireland, Brennan represented the nation at the European Junior Championships and is currently ranked as the country’s No. 5 senior player. The men will look to make the most of their nonconference schedule, playing opponents such as Austin Peay on March 13 and Grand Valley State on March 15. The first Big East conference game is scheduled for March 29 when the Bulldogs head to Villanova. Their first conference game at home comes on April 5 against Xavier. The ladies have had a bit of a rough start to their 2019 season, currently with a record of 3-5, but they have plenty of time to make the necessary adjustments to turn it around. Despite finishing 9-17 last year, the Bulldogs are in the process of making changes. The changes will be orchestrated by former assistant coach Matt Moore, who was promoted to position of head coach before the start of this season. In his first year as an assistant with the Bulldogs, they achieved their highest win total since joining the Big East conference. “We’ve got a blueprint in place that allows us to be effective and efficient within our practices and to strategize effectively heading into matches,” he said. The women have a blend of freshmen and seniors who learn from one another in order to perfect their game and prepare for matches that lay ahead. Their latest results come from Feb. 2 and 3, when they defeated Milwaukee 6-1, but fell to Indiana 0-7. Junior Nina Bertino has had a strong start to 2019 and will look to fill an important role this season. She’s 10-3 thus far in singles and credited her development to in-game experience and playing more relaxed. In addition, freshman Sara Linn has the opportunity to make an impact both in singles and doubles matches. So far, she stands 4-5 in singles and 3-9 in doubles with sophomore partner Emily Neal. The ladies are struggling in doubles competition at the moment but will look to improve as the season progresses. Butler is 9-23 so far in doubles. But head coach Moore said he looks beyond the scorecard to analyze where success and struggle reside. Moore also said he has methods that track the progress of the team. He pointed out their “grueling” nonconference schedule and the top-tier teams the Bulldogs have been playing, a level he hopes Butler can reach some day. The Bulldogs have a series of nonconference matchups that run until mid-March. This includes opponents like Denison on Feb. 10 and Illinois State on March 3. Come March 21, the women have their Big East opener away at St. John’s. Their first home conference match will be played March 30 against Providence.